Nottingham Credit Union has launched a new loan account for young families. Credit Unions are not-for-profit cooperatives owned and controlled by their members. The Nottingham Credit Union started in 1992 and has offices on Maid Marian Way, Nottingham and Clumber Street, Mansfield. Family Loans can be for any purpose. Loans from £100 to £600. Term from 3 to 12 months. Interest rate 3% per month (APR 42.6%). No arrangement fee, no early repayment fee. Applicants must be in receipt of child benefit for the duration of the loan and agree that this is deposited into their Credit Union account. Applications will be assessed and credit scored. People who are not currently members of the Credit Union can apply; they will need to become members before they draw the loan if agreed. Nottingham Credit Union offer a range of loans for any purpose. Categories: LATEST NEWS and PRESS RELEASE. Tags: Family, Loan, and nottingham. Merry Christmas from Everyone at NCU! Our Mansfield Branch will be open as usual, except for the 25th and 26th December and 1st January 2019. Where our offices close before 4pm, our phone lines will also close at the same time. The last bank transfers on 24th December and 31st December will be sent at 12pm – any requests made later than this will be sent the following working day. Bank transfers will be sent as usual all other days that we are open. Don’t be Fooled by Fraud! We may call to contact you about your account for a number of reasons but if we call we will never ask for your account details, PINs or online passwords. If you receive a call claiming to be from NCU and are in any doubt, simply hang up and call us back on 0115 828 3121 to confirm. We will never ask our members for any personal or banking information by email or text. You should not respond to any email/text asking you to divulge personal or banking information. It’s also important that you don’t click on any of the links or attachments it contains. We will never ask you to put your password into any website that isn’t our own, or download any apps other than the NCU app linked on our Mobile Banking page. We will never ask to allow remote control of your PC or contact you to make payments or test transactions from your account. For more information on how to avoid being a victim of fraud, don’t forget to use the resources over at the Take Five website or the Money Advice Service’s Beginner’s Guide to Scams. Think you’re too smart to get scammed? Take the Take Five test here to find out. If you have responded to any suspicious contact, and/or you suspect that any of your accounts with us have been accessed by someone other than yourself, please contact us as soon as possible. You can also report any believed fraudulent activity to Action Fraud, the National Fraud & Cyber Crime Reporting Centre at actionfraud.police.uk/report_fraud. We are aware that there have been problems crediting money directly to Engage accounts. 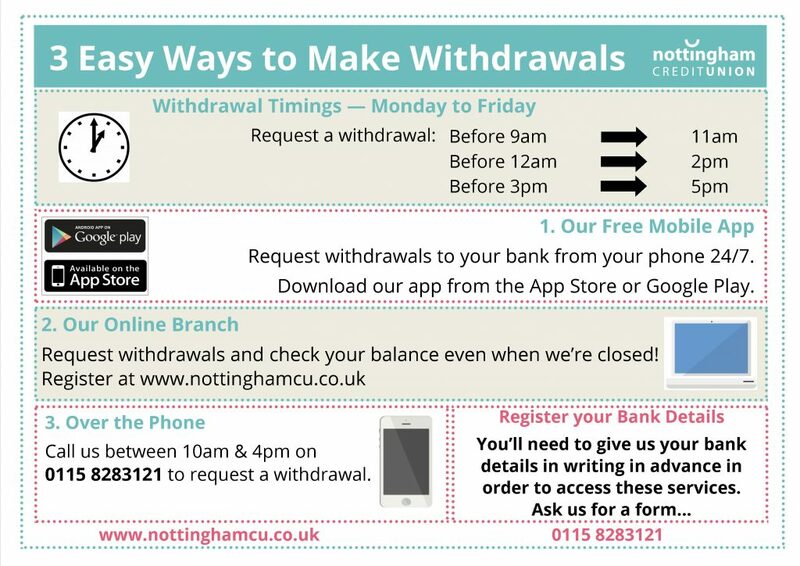 Engage is not part of Nottingham Credit Union but we’ve been working with them to find a solution to the problem. Any incoming payments that were expected over the last few days (between Tuesday morning at 9:45am and Thursday evening at 6pm) have unfortunately been returned to the sender. If any payment that you were expecting is not yet showing in your account, you are advised to contact the sender to arrange for it to be resent. Customers who have not received child tax credits are requested to contact HMRC Customer Services on 0345 300 3900. HMRC staff have been informed of the issue and will be able to assist in making the necessary arrangements for a faster payment to be sent to them. Any credits to Engage accounts, received from 6pm Thursday 3rd May will be processed as normal. Any outgoing payments that were scheduled to leave your account on Tuesday, Wednesday or Thursday up until 6pm will not be paid, although they may have shown as having left the account. These payments have been returned to accounts as of 12 Noon on 4th April. Any outgoing payment scheduled after Thursday 3rd May from 6pm will be processed as normal. We appreciate the disruption these technical issues have caused you over the past few days and we thank you for your patience. We are sorry for the disruption caused by Engage payment errors in the past week, we can only offer the guidance we have available to us at the moment. If you are still experiencing problems with your payments for any reason then you must contact Engage with your enquiry either at info@engageaccount.com or on 0333 202 3642. From 1st March 2018 there will be some changes to maximum cash limits at our branches. We want to improve safety and reduce the risk of carrying cash around by encouraging you to use card accounts. The maximum deposit will be £500 in cash per day. The maximum withdrawal will be £50 in cash per day. How can I make deposits over this amount? You can pay in cash over a number of days. You can pay in by cheque. Cheque deposits will be cleared and available to withdraw after 10 working days. You can pay money into your account electronically using your NCU Sort Code and Account Number – please ask us for your details! The maximum you can hold in your account has not changed and remains £30,000. How can I make withdrawals over this amount? 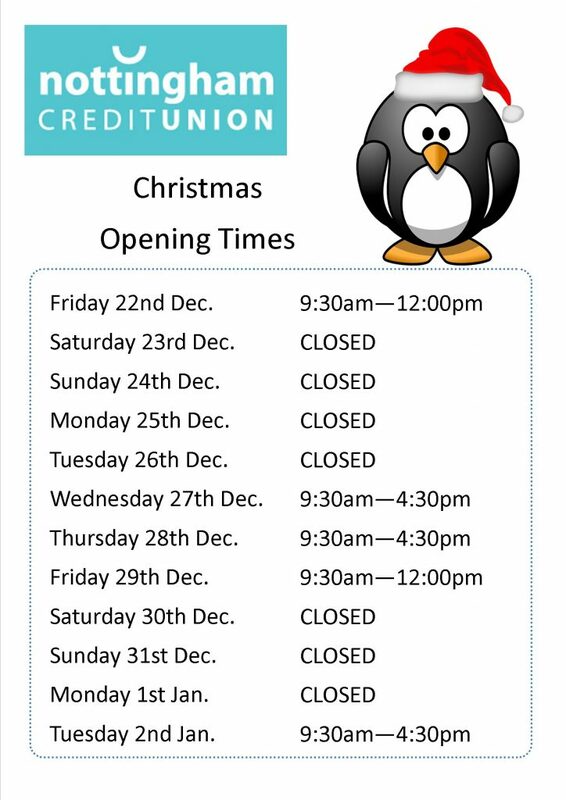 Please find our office opening times over the Christmas period below. Please note that our phone lines will also be closed at these times during the holidays. Withdrawal requests made online or using the mobile app after 12pm on 22nd and 29th of December will be processed the following open morning, according to the schedule below.